It’s OFFICIAL | Birdie's "I View"
Birdie had been getting mail from AARP for some time now and had also been taking advantage of senior discounts at the movie theater and fast food restaurants for quite a few years, but she hadn’t been OFFICIALLY OLD. Not OFFICIALLY. Recently, however, the government had alerted her that she was, in fact, OLD. It was now OFFICIAL. Birdie was on the government mailing list for OLD people. It was time to sign up for Medicare. Birdie went on-line, being assured by Patty Duke, the patron saint of Medicare, that it would be a snap. She began filling out the form but encountered a glitch on the line that asked for her place of birth. She typed in St. Louis. The form kicked it out. Birdie put it in again. Kicked out again. So she reasoned that perhaps the electronic gods of Medicare did not like the abbreviation St. She typed in Saint Louis. The gods mulled that one over for a while and finally digested it and allowed her to click the continue button. She completed the form and was assured that she would hear something soon from Medicare or possibly from Patty Duke, herself. Birdie did, indeed, hear something soon. She received a letter that told her that the information she had given on-line concerning her place of birth did not match the OFFICIAL OLD PERSON records. She would have to go to her local Social Security office to clear up the misunderstanding. This was Birdie’s first ever visit to the Social Security office. She found that it is almost as hard to go to the Social Security office as it is to go through the airport, just not as much fun because there is no vacation on the other side. You have to empty your pockets, take off your jacket, surrender your cell phone, and walk through a security monitor. You can leave your shoes on. 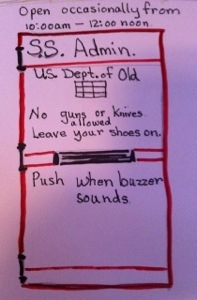 Apparently shoes do not pose a threat to Social Security officials. Birdie explained to the young man behind the bullet proof glass, who will probably never get to collect Medicare or Social Security himself, why she was there and showed him her letter. He conferred with his OFFICIAL OLD PERSON computer records, and it turned out Birdie was OFFICIALLY born in Saint Louis or St Louis but not in St. Louis. Good to get that cleared up. So just as soon as Birdie can manage to have another birthday, she’ll be OFFICIALLY eligible for Medicare. That is, if her card arrives in the mail in time. Sure hope they don’t send it to Saint Louis. Ah! All that and you didn’t even get to meet Patty Duke! I’m so glad you don’t have to take off your shoes at the ss office. And since the guy at the ss office is never going to get his benefits maybe that bullet proof glass is to protect the Officially Old! Yes, kind of disappointed about the whole Patty Duke thing. Not even an autographed 8×10 glossy. Just thought of this. Maybe she is the matron saint instead of patron saint? Thanks for reading and commenting, Linda. I’m glad you got a chuckle. I was going to say that it’s hard to believe the Social Security office has a problem matching St. Louis with Saint Louis. But now that I think about it, I’m not that surprised. Now that they are running out of money, can’t afford to upgrade the software, I guess. Of course, government programs have never been very intuitive. Why start now?